When I started investigated LCEs, I began by asking a handful of colleagues, ranging from mechanicians to chemical engineers, what their opinions were of these materials. I kept hearing the same response that, “LCEs were highly interesting but extremely difficult to manufacture.” The literature also revealed that synthesis barriers have always existed in the development of these materials. By comparison, the amorphous SMP networks I previously worked with could be synthesized in a matter of minutes using off-the-shelf materials and a UV light source. Most undergraduate students could be trained in this procedure in an afternoon. Conversely, LCEs typically required creating custom-monomers from high-purity starting materials, resulting in multiple reactions under careful conditions. My lab’s first attempt at synthesis took an entire week and resulted in less than one gram of useable material. Nevertheless, I have been persistent to find new methods to explore the structure-property relationships of these materials, while simultaneously making them more accessible to the general engineering community. The purpose of this journal club entry is to provide a brief introduction to LCE materials, their ability for mechanical actuation, and current challenges in the field. I will try to focus on the key points of these materials, though I would like to note that Brommel et al. has recently published an excellent in-depth review of the preparation of LCE materials. LCEs comprise a class of actively moving polymers that can exhibit reversible mechanical actuation in response to a stimulus. These polymers combine the properties of amorphous thermoset elastomers (entropy elasticity) with liquid crystals (self-organization) to achieve a wide range of tunable active properties. For example, LCEs can induce strain-related shape changes up to 400% in response to heat (direct conduction, electro-resistive heating, inductive heating) [16, 17] or light (cis-trans photosensitization). [18, 19] Figure 1 demonstrates an LCE lifting and lowering (contracting and expanding) in response to temperature changes. Figure 1. 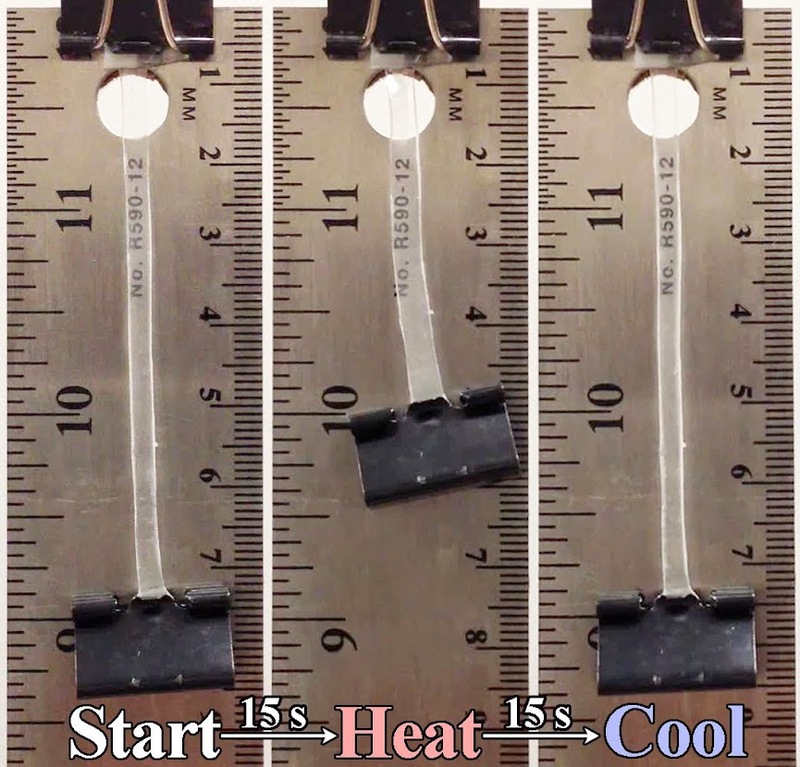 Liquid-crystalline elastomer showing reversible shape change as a function of heating and cooling. LCEs are defined by their ability to undergo reversible transitions between polydomain, monodomain, and isotropic phases (Figure 2). These phases are determined by the organization of mesogens, which are rod-like aromatic structures (usually 2-3 linked benzene rings) built into the polymer network. Although mesogens can be built into the network as side-chain groups, most researchers tend to focus on main-chain LCEs with mesogens built into the backbone of the polymer chains (and I will focus on main-chain LCEs for the remainder of this article). For simplicity, mesogens are commonly represented as grey ovals as shown in the figure to represent a rigid segment, elongated in a specific direction. Due to the high chain mobility of the elastomeric network, mesogens will self-assemble into organized liquid-crystalline domains with varying alignment and is referred to as a polydomain phase. While the specific structure of these liquid crystals is often characterized (nematic vs. smectic), it is outside the scope of this overview. A polydomain sample can be stretched to align the mesogens into a monodomain, which results in a change of optical transparency. If released, the sample will return to its polydomain, opaque configuration with stress being the driver of the phase transition. For monodomain samples, the mesogens are ordered in one direction and a high degree of mechanical anisotropy results within the network. These samples are often referred to as liquid-single-crystal elastomers. When an LCE is heated above an isotropic clearing temperature (Ti), the secondary bonds between the liquid crystals are broken. As a result, the mesogens lose their aligned formation and transition to an isotropic, unaligned state. A change in optical transparency is observed when a polydomain sample is heated above Ti, while mechanical actuation is observed when a monodomain sample is heated above Ti. Actuation is driven against the direction alignment and temperature is now the driver of the phase transition. If the material is cooled to a temperature below the Ti, the mesogens will regain their monodomain alignment and elongate the sample in the presence of stress. Otherwise, the sample will return to its original polydomain form. One of the most powerful features of LCEs is their ability to undergo a reversible phase transitions within the mesogenic domains, which results in shape- and optical-switching behavior. Figure 2: Illustration of how mechanical and thermal stimuli influence three phases of LCEs: polydomain, monodomain, and isotropic. Mechanical actuation is exhibited in LCEs when transitioning between the monodomain and isotropic phases of the material; however, the monodomain phase must first be programmed into the material before actuation can be realized. This is analogous to SMPs, in which a programming step must first occur before the shape-memory effect can be observed. One method to achieve this is to apply a constant stress to the LCE (i.e. hang a weight from the material) to induce the monodomain phase. Actuation would then occur when heated into the isotropic state; however, this is not considered “hands-free” actuation, as it requires the presence of the external stress. Several methods are available to permanently align the mesogens in a monodomain phase, which should be performed prior to the network crosslinking. The most common method, pioneered by Küpfer and Finkelmann, is to “gel-stretch-crosslink” and is used in hydrosilylation reactions. During synthesis, the LCE is mechanically stretched once it has reached a gelled state. Once stretched, the sample is heated to more rapidly crosslink the gel in the elastomeric network formation. [1, 21, 22] The stretching process mechanically aligns the mesogens in the direction of the stress. Although this method has proven functional, it is not ideal due to difficulties encountered in repeating the process under identical conditions. The step-growth reaction must be stopped once the polymer has reached the gelled state; however, it is difficult to control or predict the exact degree of polymerization after the solution has reacted for up to 24 hours. This method requires stopping the reaction during a critical point of polymerization at which the degree of conversion is increasing rapidly, making repeatability a challenge. Furthermore, during stretching, the gel may undergo a large amount of stress and structural relaxation since it is not yet a fully formed network. This relaxation step may significantly affect the monodomain orientation if the reaction is restarted and then allowed to fully crosslink the network, a process that may still require several hours. Non-mechanical methods such as surface alignment and magnetic fields can also be applied to align mesogens during synthesis. These methods must be used for one-step reactions that cannot be stopped and restarted, such as free-radical reactions. If polyimide or polyvinyl alcohol is rubbed on glass slides, the mesogens will align themselves with the rubbed direction. [23-25] Mesogens can also be aligned using magnetic or electric fields due to their diamagnetic properties. [1, 26, 27] This approach offers better repeatability compared to traditional stretching methods since the magnetic field can be tuned and held constant during the full synthesis process without the worry of time-dependent stress relaxation. Unfortunately, these methods will not work to create bulk LCE samples. The rubbed-slide approach limits sample thicknesses to ~50 microns, while practical challenges can prevent the creation of a strong enough magnetic field (typically > 1 Tesla) for magnetically aligned samples. As a result, these approaches cannot be used to make bulk samples. The ideal LCE material should be based on a simplified synthesis procedure without the need for high purity starting materials, multiple reactions, and highly specific reaction conditions or apparatuses. Most mechanical engineers would cringe at the idea of purchasing and using a reflux condenser. I believe one of the reasons acrylate-based SMPs gained popularity in the experimental mechanics and modeling areas was their ease of synthesis and overall accessibility. Furthermore, the ideal LCE material should be moldable and scalable. Most studies on LCE are performed on thin films or fibers, which significantly limits the potential applications of the material. Lastly, the ideal LCE material should not be limited by time or size when programming a monodomain for “hands free” actuation. One recent advancement towards an ideal LCE system has been made by Pei et al., in which the authors present a moldable system based on exchangeable bonds. Essentially, the material behaves as a viscous melt above a critical temperature (Tv), but as a traditional covalently bonded thermoset below Tv. This allows for separate pieces of LCE to be joined together to form bulk samples using traditional molding techniques. Furthermore, their proposed exchangeable LCEs (xLCEs) have the added capability of reprogramming of the monodomain between each thermal cycle above Tv. Currently, our laboratory is investigating a new method of synthesizing LCEs based on a thiol-acrylate Michael addition reaction (TAMAR). This approach provides a scalable process to make samples ranging from thin films to thick samples (Figure 3). Without going into the specifics of the reaction (which will be in our first manuscript that is currently under review), the main goal of this approach is to provide a robust procedure to synthesis LCE using off-the-shelf materials and basic laboratory glassware (pipettes, beakers, and slides). In brief, polydomain samples can be made by mixing monomers in a beaker, pouring into a mold, and allowing curing overnight. It is our intent that any laboratory could start synthesizing and testing these unique materials for under $2,000 in total setup costs (chemicals, glassware, etc.). We have been successful in training collaborators from other institutions in this process in an afternoon. Furthermore, programming of the monodomain can be accomplished by exposure to UV light. This process is independent of the polydomain synthesis and has been performed by collaborators at different institutions. Ultimately, we would like to see LCEs being more accessible and investigated by a wide range of engineers and scientists. This would help uncover more fundamental mechanisms of LCE behavior and better unlock the full potential of these materials. Figure 3: Examples of how TAMAR can be used to create scalable LCE samples. (Left) A 200 micron thin film, a 2 mm thick dog-bone sample, and a 4 mm diameter tube molded from a pipette. (Right) Graduate student, Mohand Saed, stretches a large LCE film to align the sample into a transparent monodomain phase. LCEs are a class of stimuli-sensitive polymers. LCEs can reversible transition between polydomain, monodomain, and isotropic phases, which is the basis for their shape- and optical-switching behavior. Significant barriers in the synthesis of these materials have limited their accessibility to the general scientific community; however, new manufacturing approaches to LCEs promise to allow more to investigations into the mechanically active nature of these materials. 1. Brommel, F., D. Kramer, and H. Finkelmann, Preparation of Liquid Crystalline Elastomers. Advances in Polymer Science, 2012. 250: p. 1-48. 2. Liu, C., H. Qin, and P.T. Mather, Review of progress in shape-memory polymers. Journal of Materials Chemistry, 2007. 17: p. 1543-1558. 3. Behl, M. and A. Lendlein, Actively moving polymers. Soft Matter, 2007. 3(1): p. 58-67. 4. Meng, H. and J.L. Hu, A Brief Review of Stimulus-active Polymers Responsive to Thermal, Light, Magnetic, Electric, and Water/Solvent Stimuli. Journal of Intelligent Material Systems and Structures, 2010. 21(9): p. 859-885. 5. Sofla, A.Y.N., et al., Shape morphing of aircraft wing: Status and challenges. Materials & Design, 2010. 31(3): p. 1284-1292. 6. El Feninat, F., et al., Shape memory materials for biomedical applications. Advanced Engineering Materials, 2002. 4(3): p. 91-104. 7. Lendlein, A. and S. Kelch, Shape-memory polymers as stimuli-sensitive implant materials. Clinical Hemorheology and Microcirculation, 2005. 32(2): p. 105-116. 8. Sokolowski, W., et al., Medical applications of shape memory polymers. Biomedical Materials, 2007. 2(1): p. S23-S27. 9. Yakacki, C.M. and K. Gall, Shape-Memory Polymers for Biomedical Applications, in Advances in Polymer Science. 2010. p. 147-175. 10. Yakacki, C.M., et al., Unconstrained recovery characterization of shape-memory polymer networks for cardiovascular applications. Biomaterials, 2007. 28(14): p. 2255-63. 11. Baer, G., et al., Shape memory polymer neurovascular stents. Journal of Investigative Medicine, 2006. 54(1): p. S162-S162. 12. Behl, M. and A. Lendlein, Shape-memory polymers. Materials Today, 2007. 10(4): p. 20-28. 13. 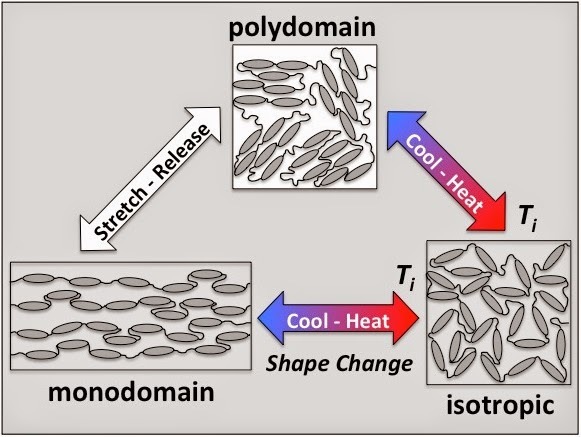 Yakacki, C.M., et al., Strong, Tailored, Biocompatible Shape-Memory Polymer Networks. Adv Funct Mater, 2008. 18(16): p. 2428-2435. 14. Rousseau, I.A. and P.T. Mather, Shape memory effect exhibited by smectic-C liquid crystalline elastomers. J Am Chem Soc, 2003. 125(50): p. 15300-1. 15. Ohm, C., M. Brehmer, and R. Zentel, Liquid Crystalline Elastomers as Actuators and Sensors. Advanced Materials, 2010. 22(31): p. 3366-3387. 16. Wermter, H. and H. Finkelmann, Liquid crystalline elastomers as artificial muscles. e-Polymers, 2001. 13. 17. Kaiser, A., et al., Magnetoactive liquid crystal elastomer nanocomposites. Journal of Materials Chemistry, 2009. 19(4): p. 538-543. 18. White, T.J., Light to work transduction and shape memory in glassy, photoresponsive macromolecular systems: Trends and opportunities. Journal of Polymer Science Part B-Polymer Physics, 2012. 50(13): p. 877-880. 19. Lee, K.M., et al., Relationship between the Photomechanical Response and the Thermomechanical Properties of Azobenzene Liquid Crystalline Polymer Networks. Macromolecules, 2010. 43(19): p. 8185-8190. 20. Küpfer, J. and H. Finkelmann, Macromol. Chem. Rapid Commun., 1991. 12: p. 717. 21. Bispo, M., et al., Main-chain liquid crystalline elastomers: Monomer and cross-linker molecular control of the thermotropic and elastic properties. Macromolecules, 2008. 41(9): p. 3098-3108. 22. Donnio, B., H. Wermter, and H. Finkelmann, Simple and versatile synthetic route for the preparation of main-chain, liquid-crystalline elastomers. Macromolecules, 2000. 33(21): p. 7724-7729. 23. Lee, K.M., T.J. Bunning, and T.J. White, Autonomous, Hands-Free Shape Memory in Glassy, Liquid Crystalline Polymer Networks. Advanced Materials, 2012. 24(21): p. 2839-2843. 24. Thomsen, D.L., et al., Liquid crystal elastomers with mechanical properties of a muscle. Macromolecules, 2001. 34(17): p. 5868-5875. 25. Lee, K.M., et al., Light-activated shape memory of glassy, azobenzene liquid crystalline polymer networks. Soft Matter, 2011. 7(9): p. 4318-4324. 26. Buguin, A., et al., Micro-actuators: When artificial muscles made of nematic liquid crystal elastomers meet soft lithography. Journal of the American Chemical Society, 2006. 128(4): p. 1088-1089. 27. Yang, H., et al., Novel liquid-crystalline mesogens and main-chain chiral smectic thiol-ene polymers based on trifluoromethylphenyl moieties. Journal of Materials Chemistry, 2009. 19(39): p. 7208-7215. 28. Pei, Z., et al., Mouldable liquid-crystalline elastomer actuators with exchangeable covalent bonds. Nat Mater, 2014. 13(1): p. 36-41. Permalink Submitted by Lihua Jin on Wed, 2014-07-09 14:45. Thanks for the interesting review. LCEs are exciting materials. It's true that the difficulty of synthesizing them stops lots of people from working on them. It's great that you develop a cheap and fast way of making LCEs. I am looking forward to your paper. Can you also make light-controllable LCEs by this approach? Permalink Submitted by Chris Yakacki on Thu, 2014-07-10 20:13. I'm glad you enjoyed the article. This approach should work with any acrylate-functionalized mesogen. For example, Tim White and colleagues do a lot with a photo-sensitive mesogen (referred to as 2-azo) which would make a great candidate to test. See Soft Matter, 2011, 7, 4318 for the chemical structure and some of their work on light-activated LCEs. Permalink Submitted by Jinxiong Zhou on Mon, 2014-07-21 22:00. Thank you for posting this intriguing topic. Congratulations to your group for inventing a cheap and facile approach to fabricate LCE. I note that your approach can synthesize polydomain LCE. A monodomain LCE is attainable after a poly- to momo- domain transition. I guess the synthesis of polydomain LCE is easier than direct synthsis of monodomain LCE. Can you approach also achieve monodomain LCE? Permalink Submitted by Chris Yakacki on Thu, 2014-07-31 18:01. Thanks for your question. I can't foresee a reason that would prevent the system from polymerizing directly into a monodomain using tradtional thin-film monodomain techniques (such as rubbing glass slides or polymerizing in the presence of an electric field); however, these techniques are limited in size and scale. We have primarily focused on creating polydomain samples initially, which can be permanently programmed into monodomain alignment using a second photo-reaction at a later time. For example, if Mohand were to shine UV light on the sample he is shown stretching in Figure 3, the monodomain alignment would be maintained permanently. While this approach requires a second step (i.e. stretching and exposure to UV light), it is generally not limited by time or scale. We're hoping to have our first study published in the near future, which will highlight this mechanism in more detail. I'll be sure to post the link when available.